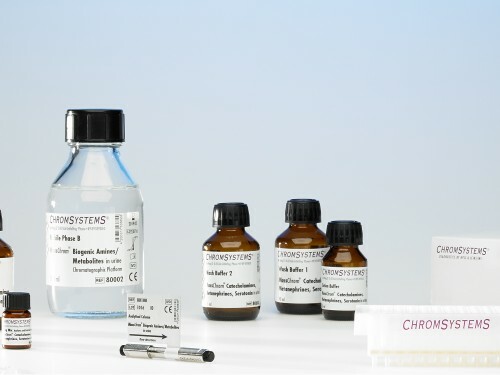 Note: In addition to this Sample Prep Set the products of the Chromatographic Platform (Analytical Column, Mobile Phases A and B, Rinsing Solution) are required. This Sample Prep Set allows the quantitative determination of total metanephrine, normetanephrine and 3-methoxytyramine in patient urine samples by LC-MS/MS. One typical application for this kit is the analysis of patient samples with a suspicion of catecholamine-secreting tumours. 6PLUS1® Multilevel Calibrator Set and MassCheck®controls ensure high precision of results. This Sample Prep Set encompasses all required components for an efficient and fast sample preparation. 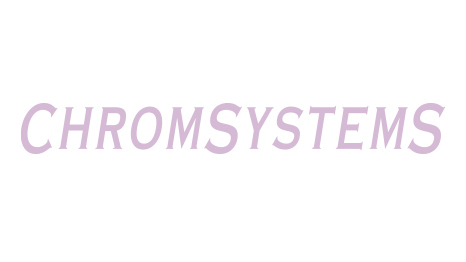 A fully automated workflow solution is also available. Alternatively, there is also a method available using Sample Clean Up Columns (80700/C). 24 h urine is collected in a suitable container with 10 ml of 10–25 % HCl. Pipette 200 μl sample/calibrator/MassCheck® control into each well of the Hydrolysis Plate. Add 50 μl Internal Standard Mix + 25 μl Hydrolysis Buffer. Seal Hydrolysis Plate with pierceable adhesive seal and cover. Hydrolyse in the oven for 45 min at 120 °C. Cool for at least 10 min at +2 to +8 °C. Place a 96 SPE Well Plate onto a Collection Plate. Pipette 50 μl hydrolysate into each well of the 96 SPE Well Plate. Add 600 μl Neutralisation Buffer. Centrifuge 5 min at 150 x g, discard effluent. Add 0.9 ml Wash Buffer 1, centrifuge 5 min at 150 x g, discard effluent. Add 2 x 0.9 ml Wash Buffer 2, centrifuge each time 1 min at 150 x g, discard effluent. Centrifuge 1 min at 2000 x g to dryness, discard effluent. Place 96 SPE Well Plate onto a new Collection Plate. Pipette 500 μl Elution Buffer into each well and centrifuge 2 min at 100 x g.
Pipette 500 μl Dilution Buffer into each well of the Collection Plate. Shake for 2 min at 900 rpm, transfer to autosampler. Inject up to 20 μl into the LC-MS/MS system. Samples are stable for at least 7 days at +2°C to +8°C in amber coloured vials. For longer storage periods keep samples frozen below -18°C. The freely available information on this website, in particular on the sample preparation, are not sufficient to work with our products. Please read instructions and warning notices on products and/or instruction manuals.